In theaters Sept. 7, "God Bless the Broken Road" tells the story of a Kentucky-based Afghan War widow, church musician and single mother struggling with her faith and the possibility of a new relationship. Harold Cronk ("God's Not Dead") directed the movie and is credited as co-writer with Catholic Jennifer Dornbush, who wrote the book version, which came last summer. Cronk specializes in films aimed at the faith audience, but with the mainstream success of recent films like "I Can Only Imagine," mainstream news outlets are taking more notice of films targeted at the faithful. And, like "I Can Only Imagine," "God Bless the Broken Road" is inspired by a song, this time one by Rascal Flatts called "Bless the Broken Road." And, like "I Can Only Imagine," it features actress Madeline Carroll. Lindsay Pulsipher ("True Blood") stars as widow Amber; Makenzie Moss plays her daughter, Bree; Kim Delaney ("NYPD Blue") is Amber's mother-in-law; and Andrew W. Walker plays Cody, a NASCAR driver who is interested in Amber. 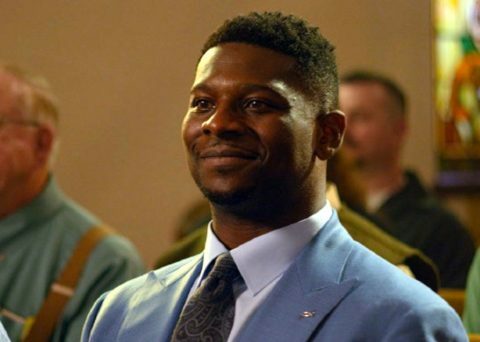 Making his film debut is NFL great LaDanian Tomlinson, who plays Amber's pastor. Early reviews are positive about the performance of Pulsipher's performance but not so much about the movie itself. There are powerful themes of doubt and redemption here, and character actor Gary Grubbs (“The X Files”) is convincing as Joe, the avuncular auto repair-shop owner who teaches “Speed Racer,” as he calls Cody, to slow down when he takes a curve. Ironically, this faith-based film requires a suspension of disbelief: Joe’s lesson is an apt metaphor for life, sure, but how could Cody have had any success on the track if he didn’t already know when to slow down? The parables of Jesus are instructive because they speak to real struggles, but Cody’s hubris is pure contrivance. ... The filmmakers display technical proficiency — shot rhythms and graceful camerawork suggest an omniscient power gently observing His charges — and there is a natural drama in seeing flawed humans struggle with their belief. But aside from Grubbs’s genuine wisdom, the characters for the most part play inspirational pawns more than three-dimensional people, their relationships held together by the most slender of threads. “God Bless the Broken Road” plants a seed of evangelical drama, but its efforts to proselytize are unlikely to bear fruit. “God Bless the Broken Road” is a very strange Frankenstein’s monster of a film, the story trying to combine too many elements while reverse-engineered into incorporating the title of a popular country song. It is unclear what anything in the movie has to do with Rascal Flatts or the song, except that Amber sings it at the end in her triumphant return to church, after her many come-to-Jesus moments: losing her home, her daughter running away on a go-kart and going to live with her judgmental, multi-level-marketing-shilling mother-in-law, finding out the story of her husband’s death from his Army pal, a climatic NASCAR race wherein her new boyfriend drives a commemorative car decked out in pink camouflage and eagles. What “God Bless the Broken Road” does have going for it is a better-than-expected performance by Pulsipher, who plays the winsome but broken woman with a deep sense of sensitivity. At the center, she holds together this hodgepodge of random story elements that otherwise don’t make much sense together at all. Just to be clear: “God Bless the Broken Road” would be just as bad a film if it were set in, say, an Orthodox Jewish community, rather than the Bible Belt (specifically Kentucky). Like nine out of 10 faith-based films, it lets the message crowd out the other elements of good art: character development, thematic complexity, even basics such as a compelling conflict. After nearly two hours of plodding storytelling, and despite an affecting performance by Pulsipher, we know nothing about Amber other than her difficult circumstances and maybe the fact that she likes Rascal Flatts and Scrabble. And the world she lives in is equally gauzy, filled with good-willed people of faith who, except maybe for her mean boss, all have her best interests at heart. None of this reaction is surprising, and some of it may be accurate. But it comes from reviewers who are very unlikely to be counted among the film's target demo. So, faith-based viewers will have to decide for themselves about "God Bless the Broken Road." Family Theater Productions’ upcoming, new and vintage productions as well as our Hollywood Outreach Programs; and, of course, you’ll find us on Facebook. Visit our YouTube and Ustream Channels for our contemporary and classic productions.